It feels like just yesterday when I was celebrating the beginning of summer and excited about its endless possibilities for rest, relaxation and a little adventure. Now, summer is coming to an end and I am left wondering where the time went. I know the saying "time flies" is a cliche, but it's sadly true. One of the things that excited me most about summer was the opportunity to cook a little bit more and experiment in the kitchen. Luckily I was able to accomplish this goal, although it wasn't always documented on my blog. The following recipes are both appetizers, both great for summer and both very quick and easy. Even though I have had a surplus of time this summer, quick scrumptious appetizers are always a hit in my book. The first appetizer (shown above) is a grilled nectarine with blue cheese. I originally saw a similar recipe on a Food Network show this summer and filed it away in my brain as something to try at some point. When I saw that my local 99 Cent Only store had nectarines this week I knew it was a sign to try this recipe out. So here's how you make them: First, cut the nectarines in half. Second, brush the nectarine halves with canola oil while the grill is heating up. (I brush some oil on the grill too.) Since we don't have a BBQ, I grill indoors. I have a Le Creuset grilling pan which gets a ton of use in my kitchen and is the perfect tool for indoor grilling year round. After the grill is heated on medium, place the nectarines halves flat side down on the grill and cook until caramelized or a little soft. This takes about 10-15 minutes. When you observe the nectarines becoming caramelized, put the nectarines on their backs and continue grilling for another two minutes. When nectarines are grilled to your liking, scoop out some blue cheese ( I actually used Gorgonzola because that was in the fridge already), grind some fresh pepper on top of the nectarines and drizzle with honey. Yummy! 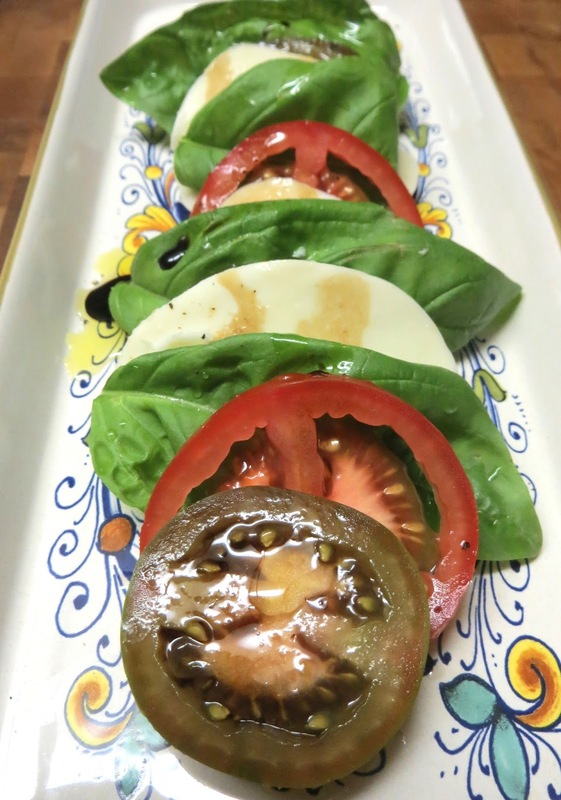 This last appetizer has been a favorite of mine for some time now, Caprese salad! I will have Caprese in all different forms: as a salad (obviously), in a sandwich, or even in a crepe. No matter how you serve it, it's always delicious. All you do for this appetizer is slice tomatoes, slice some fresh mozzarella and get some basil. Assemble the above in a layered pattern. I chose tomato, cheese, basil, although if you look closely I did deviate from said pattern. I also like to add some salt and pepper to the tomato slices which helps to bring out their flavor. When the whole thing is put together, drizzle with olive oil and balsamic vinaigrette and you're ready to go. In case you thought that there were some pickles or something "odd" intermixed with my Caprese salad, you're partially right. I'm here to introduce you to brown tomatoes, which I used in this salad. I did not know that brown tomatoes existed, but I found these at the 99 Cent Only store too. Since they looked so exotic and unique, like what you might find at Whole Foods, I had to give them a try. My 99 Cent Only store gets a lot of gourmet products such as "cocktail mini cucumbers" (that sounds sort of bad), limited edition yellow cherry tomatoes (I don't know how tomatoes can be limited editions), and hydroponic butter lettuce. My best cooking tip would be consult your local 99 Cent store (if you have one) first for produce and then go to the grocery store. It can save you a fortune, which I would like to think could be parlayed into fine leather goods or something nice from J. Crew!